Fort Apache No. 3614, Battleground No. 4754, The War Wagon, Palmer Circus, Marx Revised Pioneers …. 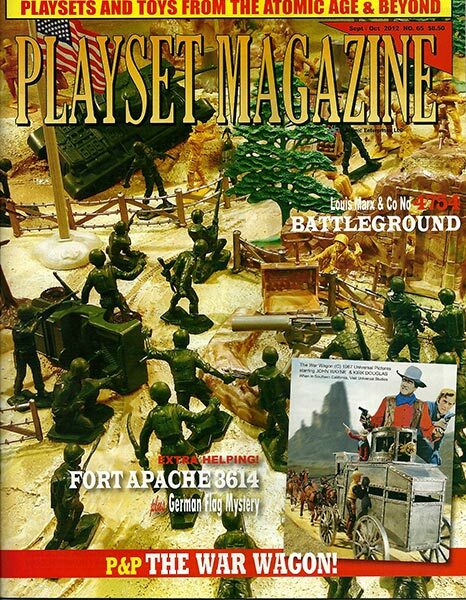 All this and more jamb-packs issue 65 with more reading and great vintage toy soldier photos! Sometimes when steak or chicken alone won’t do, you get the full buffet, and that’s what this issue delivers, plus dessert! We’re featuring not one but two great foundational sets, each with iconic figures that were reaching the end of their assignments in Marx sets. The iconic orange stripe and Magic Marxie emblazoned on the box in the same spot where just a few years before had depicted another soldier image. 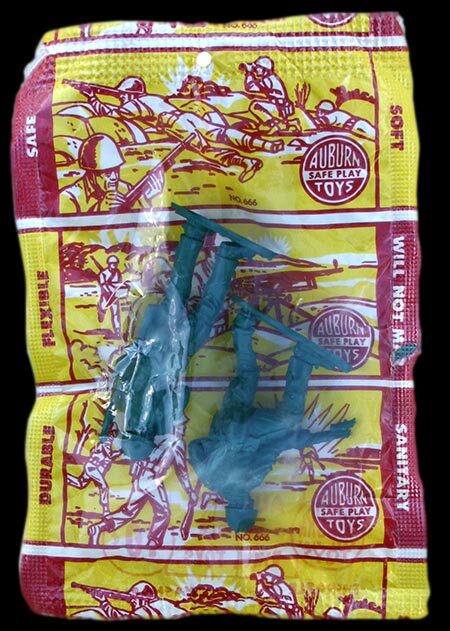 In this set are some very tough exclusives, like the OD helicopter and the rare-ish mottled hard plastic Battlefield accessory group. But it is the beautiful full sets of Marines and Combat Soldiers that were nearing the end of their run in khaki and OD green. You’ll see them in full battle scope here, too, with a colorful centerspread. Catching right up is one of the Fort Apaches we didn’t explore in greatest detail, which now gets its own feature story. This is contributor Jim McGough’s all-time favorite set, so you know this story on the Marx Fort Apache Stockade No. 3614, a set with rare colors to feast the eyes upon in our new, all color pages! Next there is a super story on the Marx German Flag, with input from the Man who designed it, Al Bagg! This is official stuff from inside the halls of Marx, folks, and it answers a really mysterious question that has gone unanswered for 45 years! And there is a feature story on the revised pioneers, the Palmer Circus set complete in rare rare rare mint bag set (we show probably the only intact one ion the world!!!) and several others. 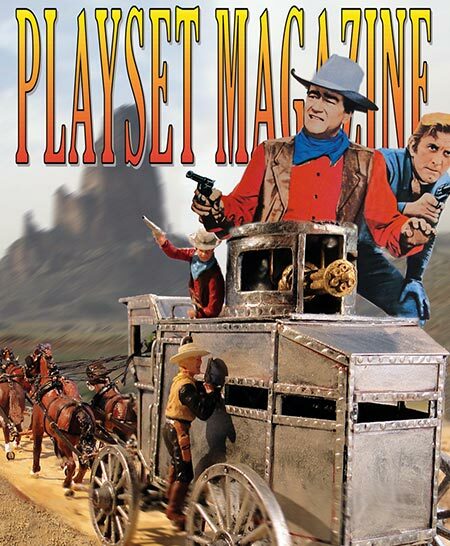 Western aficionados will thrill to the great multi-page color spread story on John Wayne’s The War Wagon, recreated in miniature by Larry Patterson of P&P productions, done in 54mm scale with miniature character figures of John Wayne and Kirk Douglas based upon their terrific Universal Studios feature film. And we mustn’t forget the cute piece on the Auburn Farm’s chicken coop packaged display, also! 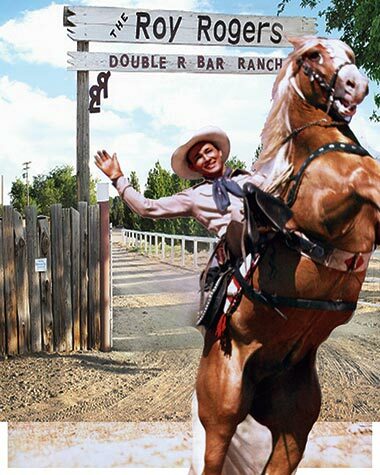 And the sale of Roy Rogers' ranch, with the gateway that Marx modeled the playset on! And Rick Eber and George Krolls Indy report with pictures! German Assault Troops You’ll get your fill of desert, too! Feast on great reviews on FIVE new soldier releases from our best manufacturers, including the new German Assault Troops and (wow!) Medical Team in real injection molded soft plastic by CTS, the artillery unit, and TSSD’s Tombstone Showdown figures for the Clanton Gang, and a great new set of Roman and Barbarian poses! The only guy not here is Ron Barzso’s new Revolutionary War spectacle Lexington Green, and we covered that preview last issue. Special shout-out of thanks this issue to connoisseurs David Schafer who sent the Palmer set, and to Allan Ford, upon whom we had to rely to get some great and important Battleground pieces when we found we had put ours away for ‘safe keeping” so good we can no longer find them, and a big-bang WOW to Larry Patterson for the War Wagon! And to Rick Eber, Rush McAllister and others so good hearted and fraternal for their help. 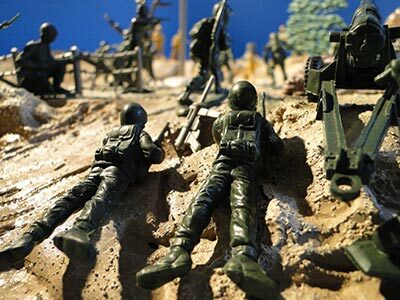 COME TO THE BIG TOY SOLDIER SHOW! 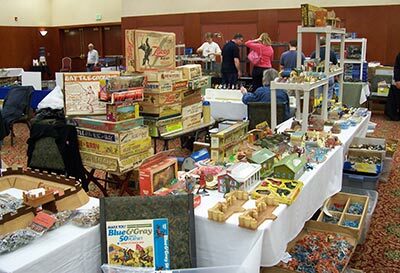 Why not plan to come and visit with all your friends and fraternal members for the greatest few days of toy soldierin’ the hobby has ever known! So, see you there and until then, Great Hunting! PS – our next story is a history making with the Marx Wyatt Earp Official Hugh O’Brian Dodge City Western Town, featuring Hugh O’Brian himself on our pages for Christmas! PSS – I was just looking over the stories, colorful photos and excitement contained in Issue 65. I am very proud of this and the fine collector folks who made this issue come together. I do hope you feell you are getting more than your money’s worth with issues like these!